Raw meat and poultry, in particular, carry harmful bacteria, which is why it is so important to thaw poultry correctly. However, the good news is that with correct handling and cooking, chicken is quite safe once it is cooked. Keep raw meat away from other foods and make sure the juices don’t come into contact with fresh, ready-to-eat foods. Always wash your hands thoroughly before and after handling raw meat. Wash utensils, equipment and kitchen counters with hot soapy water after preparing chicken. Always use separate cutting boards and utensils when preparing raw and cooked chicken. The recommended method is in the refrigerator. Although it is the slowest, it is by far the safest. First check the temperature of your fridge. Bacteria grow rapidly in temperatures of between 5°C and 60°C / 41°F – 140°F. So your poultry should be kept at a temperature below 5°C / 41°F. You will need to allow 5 hours per pound of meat. Leave the bird in its packaging and place on a platter. As the bird melts this will catch the juices. If you remove the packaging, cover the meat with plastic wrap. Position your chicken on the bottom shelf of the fridge so that the juices don’t drip onto other food. This is a faster method for thawing chicken that in the refrigerator. Either leave the chicken in its original wrapper or place in a leak proof bag to prevent water entering the bag and contaminating the chicken. Fill the sink with enough cold tap water to cover the chicken. The chicken needs to be fully submerged for safe thawing. The water will need to be changed every 30 minutes to keep the water cold. Allow 1 hour per pound. Once thawed, cover and place in the refrigerator until ready to use. Don’t be tempted to use warm water to try and thaw the chicken faster and risk the growth of bacteria. Once the chicken is thawed, remove from the sink and wash the sink and all utensils used with hot soapy water. Care must be taken when thawing chicken in the microwave as the meat may not thaw evenly. This method suits smaller pieces of poultry, rather than large birds. Use the auto-defrost cycle on your microwave and check the manufacturer’s instructions for thawing times. Place on a microwave-safe dish to catch any juices. Check the chicken regularly to make sure it doesn’t start to cook. Once your bird has been defrosted it needs to be cooked immediately rather than stored in the refrigerator. Never defrost poultry on the countertop. 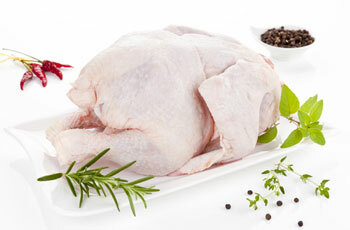 Chicken needs to be thawed at lower temperatures to stop the growth of bacteria. Always make sure the chicken is thoroughly defrosted before you cook it (otherwise the center may not be cooked when the outside looks done, which may lead to food poisoning). Never refreeze poultry once defrosted. Chicken, once defrosted, can be stored in the refrigerator for 1 – 2 days before being cooked. Store fresh chicken in a loosely covered container in the refrigerator. Make sure that any raw chicken is placed on a low shelf in the coldest part of your fridge away from other foods.